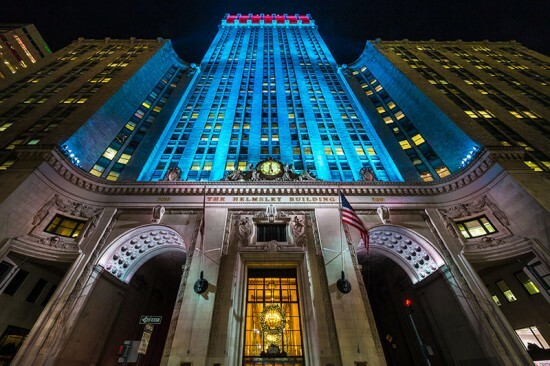 On Monday, December 3, the "Jewel of Park Avenue" at 230 Park, aka The Helmsley Building, really began to sparkle as building-owner Monday Properties unveiled a new LED lighting display to a crowd huddled at the base of the building, staring upward with anticipation as rush hour traffic swirled around. Monday Properties President and CEO Anthony Westreich and Manhattan Borough President Scott Stringer stood together to push a giant red button, officially triggering the light show, which flickered into action, turning heads of passers by for blocks around as a live violinist provided musical accompaniment. Built in 1929, the 34-story tower stands guard over Park Avenue, terminating the street's vista looking south on the same block as Grand Central Terminal, and is one of the only buildings in Manhattan that you can literally drive through, underneath monumental stone arches. Designed by the same architects as Grand Central—Warren & Wetmore—230 Park was originally the headquarters of the New York Central Railroad Company and features many rail-centric decorations inside the building's ornate lobby. 230 Park has undergone an extensive renovation, bringing its 1.4 million square feet of office space into the 21st century and earning a LEED Gold certification. The new lighting scheme, designed by Al Borden of Philadelphia-based The Lighting Practice with LED lights by Lumenpulse, is part of the building's sustainability program, Westreich noted at the lighting ceremony, reducing energy requirements by 70 percent from the high-pressure sodium lights they replaced. “Our intent has been to give the building a lively nighttime appearance by reinterpreting its historic forms and proportions with concealed uplight sources,” Borden said in a statement. “During daylight hours, when downlit by the sun, the building’s architectural details have a familiar appearance. At night, we flip the source upside down and present a new way of looking at the building. People will see details very differently and have a new experience of the architecture.” Overall, more than 700 color-changing LED lights have been installed on the building, hidden from view on the street. Each is programmed into a computer than can coordinate a fanciful light show, as was seen at the unveiling, or a simple static light wash at night. Dynamic light shows can be expected during special events and on holidays like the Fourth of July or Thanksgiving. Chairman of the New York City Landmarks Preservation Commission Robert B. Tierney lauded the renovation and lighting efforts at the event, stating, "This is a model of restoration and preservation of one of the most important buildings in the city of New York, and therefore the United States." Scott Stringer was equally enthusiastic about the project during his speech, "The fact that this is a building that's sustainable, that speaks to reducing energy, is really about the future of cities around the country and around the world." While the wash of color along the building facade creates a vibrant profile for the building at night, the real power of the light is at the tower's ornate cupola, where the building's detail comes into view in stark contrast to the rigid grid of windows on Walter Gropius' neighboring MetLife Building. Since Wednesday, an aluminum woman is joyfully resting in the grass of City Hall Park. Among her well-set figurative friends are a bronze giant, an octopus man, and a couple of luminous neon creatures. The new sculptures are part of The Public Art Fund's yearly exhibit in the park, an ongoing project for more than 30 years with the aim of making visitors experience art more directly. This year’s show, named Statuesque, brings together a group of six artists from four different nations­. The ten works experiment with the sculptural tradition of the human figure, and are installed along the park's pathways and on lawns. 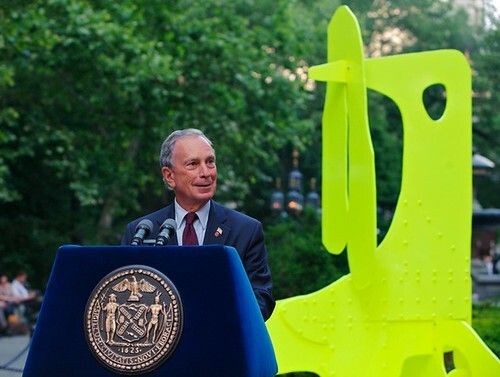 “City Hall Park is really a great backdrop for this art,” Mayor Michael Bloomberg said at the opening. “The placement invites people to get up close and personal with these more contemporary figures and sculptures.” The featured artists are Huma Bhabha, Aaron Curry, Thomas Houseago, Matthew Monahan, Rebecca Warren, and Pawel Althamer. Never displayed together before, the pieces all tend towards abstraction over realism, and texture over refinement of finish––some exuberant, many robot-like and other almost gruesome. “It is unfiltered, it is memorable and it is immediate,” chief curator and director of The Public Art Fund Nicholas Baume concluded. New for this year is a free cellphone audio tour via an iPhone app.